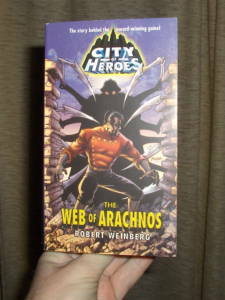 Pic of the day: The book in question, "Web of Arachnos" by Robert Weinberg. This novel is the first set in the fictional universe where the game City of Heroes takes place. This is almost certainly its main selling point. It does feel old-fashioned, but this may be because it is actually set in the Great Depression. It does also smell somewhat of cheap hack. It doesn't in any way have the glow of a Book with a Mission. That said, the book is largely true to the myth. I disapprove of having Statesman fly this early in his career, but I guess it follows from his rewritten creation myth, in which he basically gets all his powers in a flash. Still, most of us spend quite some time unlocking our powers, and it would be fitting for Statesman to also have to gain some experience before unlocking them all. In all fairness, there is some span of time from his transformation until he takes up a life of fighting crime, so he may have had some time to experiment. But "experiments" is not quite the same as "experience". In the end, I think this book will not find much of an audience outside the players of the massive multiplayer online game. It is good writecraft but nothing more. It lacks the spark that the game itself has, and the vividness of the creation myths that was all we had before the game came out. For some good backstory you should read the background parts on the CoH.com website instead, and watch the old E3 kinematic preview. If you like Weinberg's writing, or if you just love to read novels, I suppose I can't stop you from buying it. It isn't bad. I've read bad novels. I've WRITTEN bad novels. But you can find CoH fanfic online for free that conveys more of the spark and the sense of wonder that made people flock to Paragon City in the first place. Two years ago: Psst! Wanna see my aura?